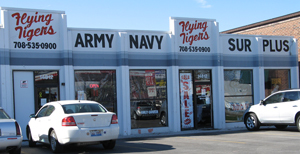 A family owned business since 1985, Flying Tigers Army/Navy Surplus provides excellent customer service and the highest quality products. We are very proud to have earned our reputation and will continue to maintain this level of service. We specialize in everything Military, from Military medals and insignias, to BDU's, Flight Suits, Flight Jackets and Field Jackets. We service members of the Armed Forces and local municipalities daily with our extensive boot and shoe section including brands such as Bates, Converse, Corcoran, Magnum, Rocky, and Thorogood, just to name a few. When it comes to Military patches, medals and insignias our inventory is one of the most extensive collections out there. We carry all available service awards in full size, miniature size, hat pin, lapel pin and ribbons where applicable. 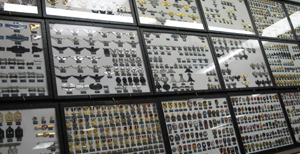 Our collection of badges, patches, insignias and other collective memorabilia is nothing short of impressive. By having highly qualified in-house Embroidery Specialists and Seamstress we can provide custom embroidery and patch placement on just about any item we carry. 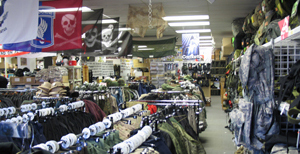 All military surplus stores are not alike. If you are ever in the Chicagoland area, come visit us at our retail store located at 14812 South Cicero Ave., Oak Forest, IL 60452; phone 708-535-9921. You can also find us online on Facebook or Twitter.